The ups and downs have continued, a bit. I was away for work over last weekend, and during time, Derby sliced the inside of a hind leg open. Liz was babysitting him for me, and gave him some excellent first aid, and arranged to have him kept in for a couple days, since we’re still mired in mud. The wound is healing nicely, and I did a couple short rides this week when I returned. However, he started to spring a shoe, and I was determined not to call my long-suffering farrier, since we have an appointment for tomorrow morning. So for the last two nights, we just walked. 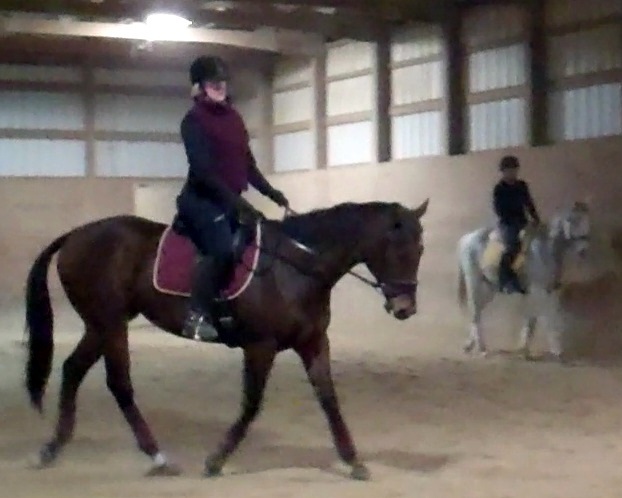 Derby was bug-eyed at a the newly opened arena doors, so I took the opportunity to do lateral work, and really feel his hind legs. 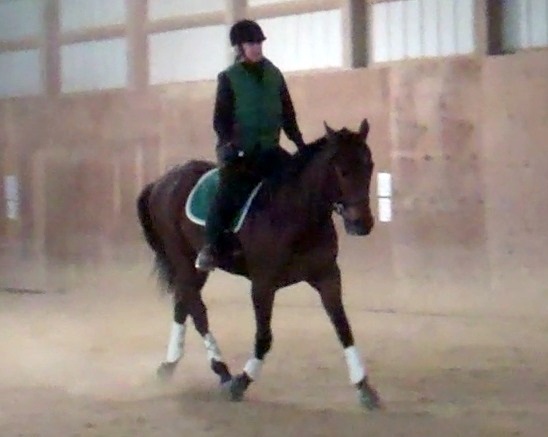 Getting control over the inside hind is the key, but I don’t have a ton of feel for that yet. I have family coming in this weekend, and won’t be riding Friday and Saturday. Sunday we’ll be back in business, and next week we’ll restart regular lessons. In other news, my friend Frank leaves for a new home on Saturday. His new owner is besotted and he’s going to a lovely farm with rolling, grassy pastures. We’ll miss him terribly but it sounds like a great place for him. My very best wishes to Deb and Frank for many happy years together! Contact isn’t a game, and it isn’t magickal. Well, the crappy weather is upon us, and I donned my favorite cold weather britches tonight (Irideon Wind Pros), wool socks, turtleneck, fleece, jacket and stocking cap and headed out. The horses were stuck inside for a second day, due to the heavy rains that have turned their paddocks into seas of mud. Derby was really happy to get out of his stall, to say the least, and the rides we’ve been having lately are great motivation, even on awful nights such as this one. The walk quality for the last couple days has been really good from the get-go – really powerful and swinging – which I attribute less to my riding and more to the fact that Derbs has been cooped up and has a lot of energy. I’m taking advantage of it, though, and am using the walk as a foundation for getting him really through and into the bridle. The contact I’m getting is so strong, and even – he’s really pulling into the bit, and I’m feeling his back under me consistently. Really consistently. 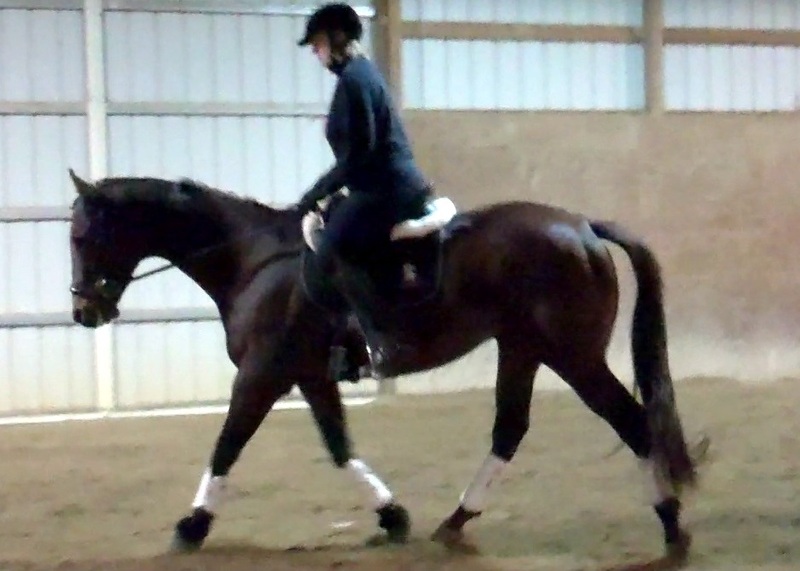 I’m even starting to play with lateral work at the trot – shoulder-in and leg-yield – movements that are way head of the game for us, but helpful in engaging (and strengthening) his hind end. I attribute our ability to generate shoulders-in and leg-yields directly to the this new-found solid contact. *This* is what a connected horse feels like! I had a few glimmers of this with Maddie, but wasn’t able to hold the feeling. Derby and I, on the other hand, have been able to hold it together pretty well lately. We also have a fantastic free walk – Derbs will follow the reins down to the end of the buckle, and he’ll stay there. 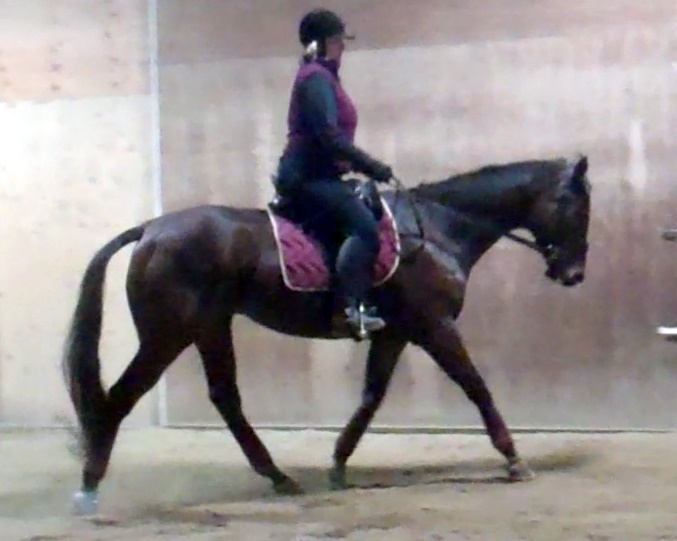 We’ve also experimented with stretchy trot, which is also growning pretty reliable. I can pick him up, stretch him down, rinse and repeat to my heart’s content. It’s such an elementary thing but I know – from my own experience and from watching the Dover clinic – that contact is fundamental. It’s not a game, as some would have you believe, and it’s not an ephemeral state. It’s physical, it’s feedback, and it’s truly something the rider doesn’t take. The horse has to give you contact, and the rider has to create the environment that encourages and rewards the horse for doing so. After three great rides, I was hoping to keep the momentum going but Derby was feeling the effects of the stepped up work ( at least that’s what I’ve concluded, and I had overdone things in a workout earlier that day and had almost zero in the tank. Our work was OK, and we got the canter both ways, but Derby was resistant and registered his discontent with a little buck. Friday the horses were back outside (the icky weather kept them inside for a couple days earlier in the week) and he had the day off. We started today with a set of new shoes, but Derby was still a bit uncomfortable for the farrier, and I had to free longe him to loosen up his back end so he’d tolerate getting his hind feet trimmed. Our ride – my first on my own since the clinic – was pretty good. 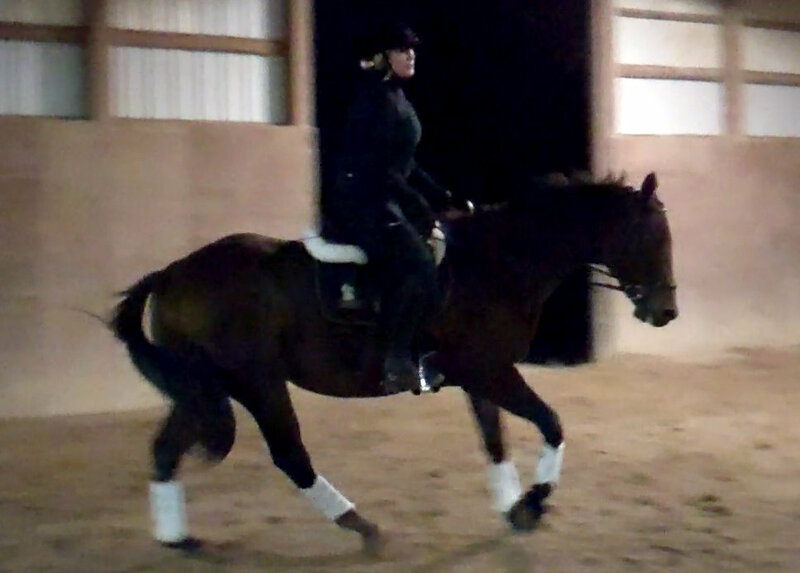 I worked on lateral work, especially leg yielding the trot, and did some canter work both ways, and his attitude was much improved compared to Thursday’s as well. 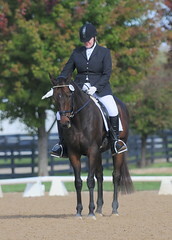 Overall the contact was pretty good, as were the quality of the gaits. After we rode, I put him on the longe, for the prescribed longe work. He was swapping leads pretty badly earlier in the week, but today I got good quality work both ways. I do hope we’re well along the road to recovery and loosening (and strengthening) those big muscles.